A female 30 y.o., right hand dominant, admitted at 4th post-injury day with a fracture of her left forearm. The forearm was fractured 7 years ago and treated non-operatively elsewhere. Most likely an external fixator will be used. The question is about the distal RU joint. Whether it is worth to perform radial distraction to improve relations in the DRUJ, or just the acute fracture should be fixed with no care about other? Has she had any previous distal radioulnar joint problems? In any case, I don't think you should leave a 30 year old with chronic distal radioulnar joint disruption as I think it is likely that she will eventually develop arthritic change. I'd treat this with plating of the acute fractures and I'd treat the DRUJ disruption with osteotomy through the old radius fracture site and ulnar shortening. (I might do it as two stages depending on the soft tissue traumatic injury as the radial osteotomy would increase the zone of injury and convert a relatively simple radius fracture into a segmental fracture.) 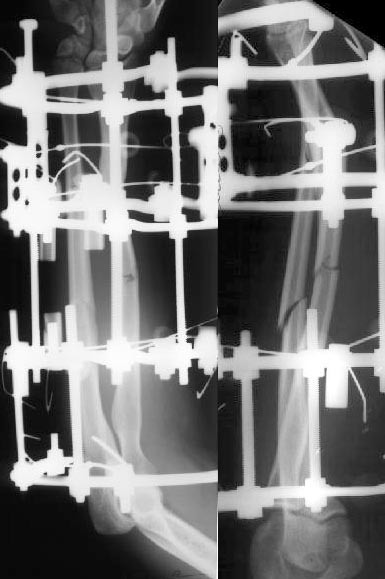 If you are doing it with Ilizarov type external fixation, I would lengthen the radius at the same time you fix the both bone fractures as I believe she will do better in the long term. A second fracture after a malunion does present the opportunity to try to correct the deformity from the original injury. I have done this for angulatory deformities when the second fracture is at or near the original injury. In this case the radius healed quite short (1.5cm) but only angulated a few degrees and now there is a radius, ulna shaft fracture more proximally. 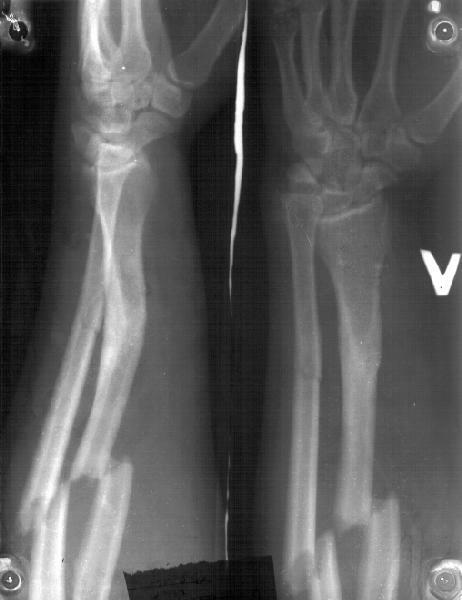 One could consider purposefuly shortening the ulna shaft fracture and plating both radius and ulna to end up with an ulna and radius of equal length but both short. However, ulna shortening is harder to accomplish than it would seem. Your external fixation techniques offer the potential for lengthening the radius through the fracture which I suspect you are considering. Theoretically it should work although the DRUJ won't ever be normal. The most common treatment here would be to plate the acute radius and ulna fractures and then come back when healed and perform a Darrach or Sauve- Kapanji DRUJ procedure. SR> Has she had any previous distal radioulnar joint problems? She marked some limitation of wrist ROM, but can't demonstrate the range on her intact extremity. Anyway she even didn't think about doing something about this. Frankly speaking i was inclined to limit her treatment with reduction and fixation of the acute fracture but your and other opinions posted to the list make me change the plan. At the moment an external fixator is applied. I already over-compressed the ulna a bit, and under-compressed the radius. After a few days i plan to start gradual compression of the ulna and distraction of the radius.